Elevated healthcare costs are the biggest single risk most employers face. As the cost of health care continues to rise, profits are weakened and employers must decide how they will keep their businesses running while continuing to provide healthcare coverage for their employees. This requires employers to implement many different cost containment strategies such as offering high deductible health care plans, changing insurance carriers, reducing benefits, cost shifting, ceasing to offer a health plan, and offering a health and wellness in the workplace. Here are three charts that show why health and wellness in the workplace programs are important and here to stay. 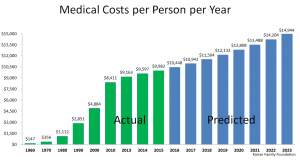 Kaiser Family Foundation data on healthcare costs per person per year in the United States shows that costs have increased every year. Presently, the United States is spending just under $10,000 per person per year in healthcare costs. This is an average across every person in the United States. Going forward, it is predicted that costs will continue to increase reaching almost $15,000 per person per year in the year 2023. Employers and employees will have to decide who will be paying for this added cost. There is a different way to look at this cost. The gross domestic product is a measure of how much the United States produces. For example, 3.5% of everything the U.S. produces is created to support the U.S. military. Said another way, for every $100 worth of stuff that is produced in the U.S. $3.50 of those $100 was spent on the military. 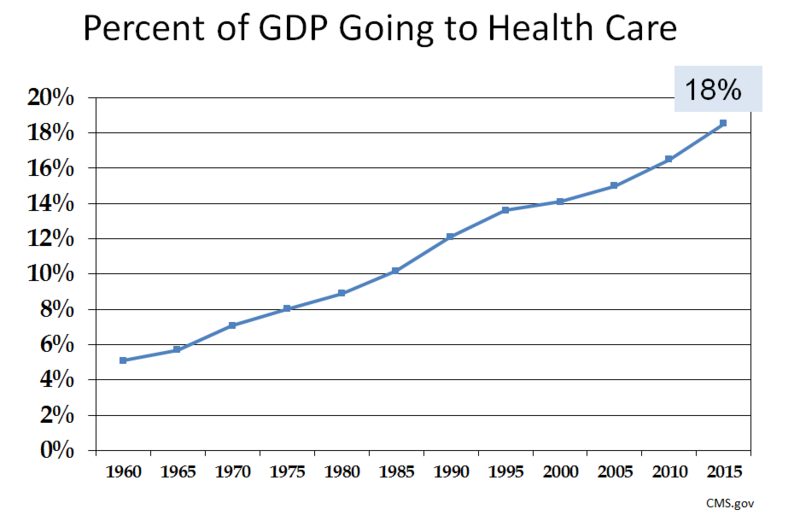 In the 1960s, about 5% of everything that was produced in the U.S. was associated with health care. Every year since then, the portion of our entire economy that is devoted to paying the cost of health care has increased until today, where healthcare costs account for over 18% of our gross domestic product. Approximately $18 of every $100 of production in the U.S. is associated with the cost of providing health care. As you can see from this graph the cost keeps going up every year. Perhaps someday in the future, 100% of all that is produced in this country will be tied to the healthcare system. At that time, every man, woman, and child in the United States would be a doctor and we would take turns treating and billing each other. Obviously we are never going to reach that point because we have to do something else in this country besides spend money on health care. But my point is that the cost of health care has become one of the largest single expenses that exists in the United States today. 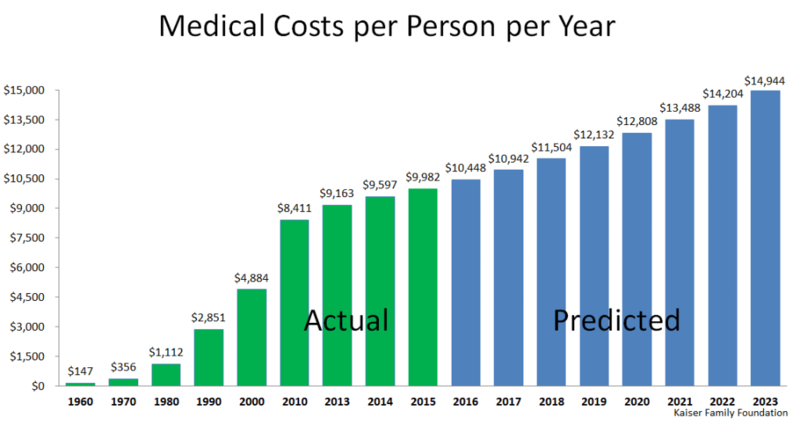 And, if you look at past trends it is pretty easy to predict that the cost is likely to increase in the future. The increasing cost of health care is particularly painful for employees. This last chart shows three sets of data. The bottom line represents the rate of inflation we have experienced over the last 15 years. In that time, the costs of goods and services that we all pay for has increased about 38%. During that same time the increases in salaries and income we have all experienced have been slightly more than that, or about 47%. These two bottom lines show that inflation is real and that things cost more in the future than they did in the past and our earnings are just barely staying ahead of the increased cost due to inflation. 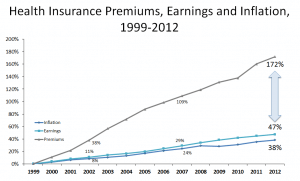 The top line in this chart shows the increase in the cost of our health insurance premiums over the same time. The cost of medical care has increased at a rate six times faster than normal inflation and our income/earnings have failed to keep up. The arrow on this chart shows the difference between the increases in healthcare costs and the increases in earnings we have experienced during the same time. It is the gap between the increase in how much we have to pay for health care and how much money we get to take home. The struggle that many employers face is to decide who is going to pay this difference. Should the employers pay for the increased cost or should they pass the increased cost of health care on to their employees. Working Americans feel the pain associated with high healthcare costs when we bring home less money. Besides the cost reduction strategies mentioned above, employers can reduce the demand for healthcare services by helping employees improve their health. 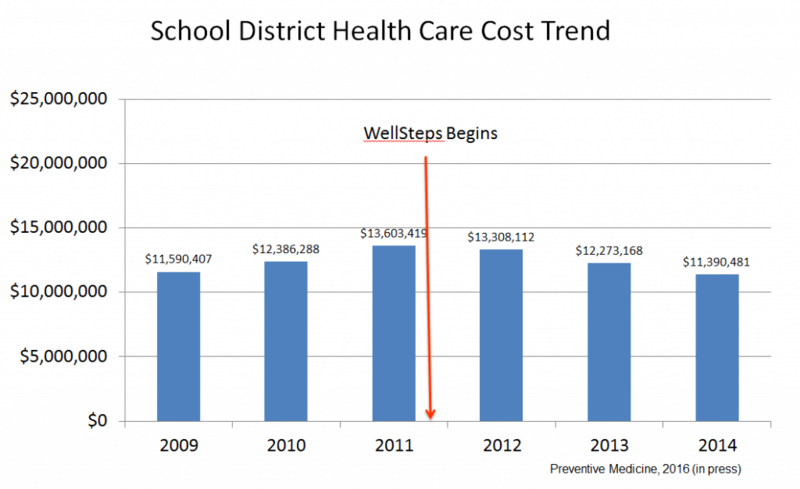 This is where the impact of effective worksite wellness programs comes into play. Public health models tell us that poor lifestyle behaviors lead to elevated health risks like high blood pressure, high blood cholesterol, and high blood glucose. These elevated health risks eventually lead to expensive and deadly chronic diseases. Health and wellness in the workplace can improve employee health behaviors and lower health risks can reduce the incidence of chronic diseases such as heart disease, cancer, stroke, and diabetes. These are the most expensive diseases to treat and these diseases are almost exclusively lifestyle related. I have spent my entire life studying and researching the impacts of worksite wellness programs. These programs can improve employee health and they can impact employee healthcare costs but they cannot reverse the ever increasing costs associated with healthcare services. Worksite wellness programs can dramatically improve employee health and they can bend the healthcare cost trend, but they are not a long term solution to combat sustained upward cost pressure. This is because of the fact that poor employee health is just one of the many factors that explain why the cost of healthcare is so high and continues to rise. In 2015, we published a research paper and a white paper on the impact of a health and wellness program on a large employer located in the Western United States. After three years of an aggressive worksite wellness effort, we documented clear improvements in employee health, reductions in health risks, and improvements in productivity. This last chart shows this employer’s actual healthcare costs per year for three years prior to and three years after implementing an effective worksite wellness program. The worksite still spends between 11 and $13 million a year to provide healthcare services for their employees but over the six-year period of this study, healthcare costs did not increase. Other worksites and organizations in the same geographical area experienced dramatic healthcare cost increases during the same time. This is just one reason why wellness programs are important. The three graphs above show us why health and wellness in the workplace is important. They provide clear evidence that the cost of healthcare in the United States has and will continue to increase at an unsustainable rate. Employers will do everything they can to control that cost, but more and more are passing the cost increases along to their employees. Many of the real drivers of healthcare costs are beyond the scope of worksite wellness programs, but worksite wellness programs can reduce the demand for healthcare by improving employee health. The cost of healthcare is going to continue to increase. The only real question employers have to face is what they will do about it.